Watch your favourite video songs and movies in video player. It supports MP4, DivX, XviD, H.264, H.263, WMV file types. Listen to your favourite songs in music player. It supports MP3, WMA, WAV, eAAC+ etc. file types. Though it lacks some features found in its big phone rivals, the Nokia Lumia 1520 is a great buy for Windows Phone fans seeking a supersize smartphone with premium hardware. A fast processor, plenty of storage. A strong 20-megapixel camera for the same on-contract price as a smaller premium phone. Its size makes one-handed operation difficult, and call quality was muddier than on most Nokia phones. Limited voice dictation and voice assistance in the OS hobbles its usefulness as a phablet. Nokia's line of Lumia devices seem to be expanding on a weekly basis. 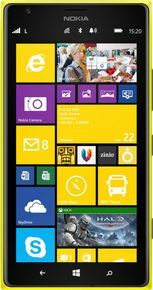 Recently we've had the Nokia Lumia 925, Nokia Lumia 1020 and the Nokia Lumia 2520 tablet. With the Nokia Lumia 1520 though, the brand is entering the phablet market - pitching the device as a smart phone and tablet hybrid. Windows os with big display phone . Front Camera onky 1.2MP but it give high quality image. That no other 1.2 cam can give. Really amazing. Rear camera with 4k recording . Windows os realy wonderful . If u get the using method then u cant leave from it. People doesnt know about phablet. I love windows OS its totally a lag free device with good quality features... if you can invest above 40k money go for it ! my dear friends Windows OS is the fastest OS. Lagless. But only problem will be that the price of the phone is toooooooooooooo toooooooooooooo high. We are getting more specifications in lumia 2520 in less price. So why go for it ?